As I think I've reiterated time and time again in this feature, the most horrifying thing imaginable isn't always some monster. Sometimes it can be something as normal as baseball and mom's apple pie. Sometimes horror can be about confronting the ugly, scary truths right under our noses that we're too afraid to view in the light of day. 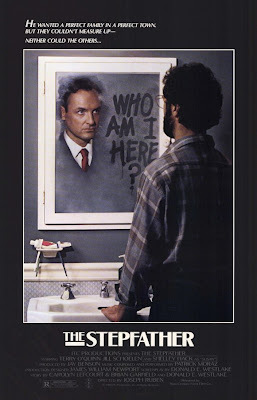 1987's The Stepfather doesn't really deliver on big scares like some other films I'm watching this month, but it certainly preys upon an insecurity that plagues American society like no other: the nuclear family. Today's story is that of Jerry Blake. Seemingly a normal family man, Jerry strives for perfection in his domestic life. He has married a nice woman in suburban Washington and adopted her teenage daughter as his own. How perfectly fine of him to do such a thing, yes? No. In fact, "Jerry" (Terry O'Quinn, Locke from Lost) is a very disturbed individual who moves from family to family across the country, striving to find the one that will fit his homicidal idea of suburban perfection. And when they don't measure up to his impossible standards, he simply murders them and skips town. Stepfather is a critique and examination of the revival of the 1950's ideal of suburbia and family life as it appeared in the Reagan era. Not exactly subtle by any means, a discussion of the eponymous character's home life is conducted under a gigantic portrait of Ronald Reagan at one point during the film. Jerry alludes to a "strict" upbringing that it is implied has left him with a freakish idea of what a proper family should be like. When his stepdaughter Stephanie begins exhbiting normal sixteen-year-old behavior such as getting in trouble at school and kissing boys, he exhbitis signs of his inner insanity. Really, Jerry isn't a serial killer from a horror movie until he is prompted to by completely understandable circumstances. Until that point, he' just your, the viewer at home's, stepfather. The movie that Stepfather remind me of most is the essentially contemporaneous American Psycho, another examination of 80's conservatism. Whereas American Psycho made the Wall Street yuppie into a killer, Stepfather shows a figure that has always existed and will probably never entirely vanish from American society: the suburban patriarch. While it's easy to say that an MBA with an obsession with business cards and Phil Collins probably murders and eats people, it is an infinitely more difficult notion that one's own (step)father is some sort of bizarre psychotic barely holding on to his sanity and is the type to murder his family in cold blood. Jerry's identity as a psycho killer is revealed before the opening credits, so it's never really a mystery as to what his motivations are, therefore a lot of the thrills are taken away. Still, The Stepfather succeeds as a social satire and never succumbs to cheep thrills like other slashers; so maybe it wasn't the best choice for this project. Still, there's a fairly high body count; what more do you want from me? But was it scary? Not really. This one was more socially conscious thriller than straight up horror. Not so much grisly as thought provoking.